After a Summer's rest we're kicking off October proceedings with a venue change and two of our absolute favourites. 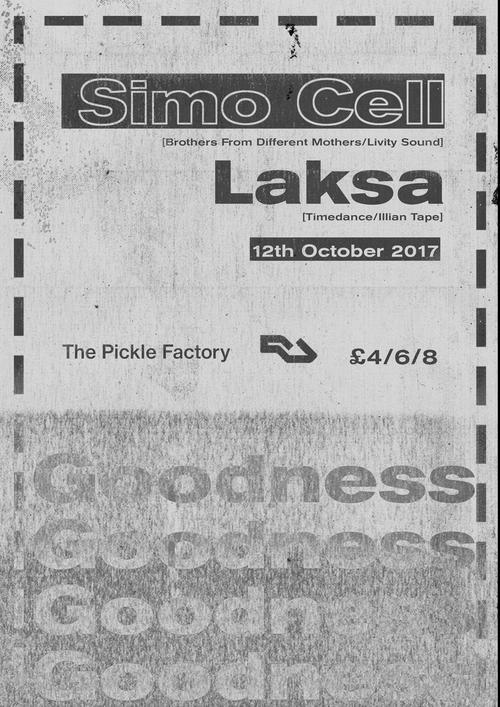 Gracing the decks for our third party - this time at Bethnal Green's The Pickle Factory - Frenchman Simo Cell making his London debut alongside London-based Bristolian Laksa UK. Making his London debut is the go-to ambassador for the burgeoning French scene, Nantes-born, Paris-based Simo Cell. Fusing his own schooling in a wide range of electronic music with UK-tinged sounds and IDM his flexible, unpredictable and undeniably unique take on techno always makes for a system-smashing set. A firm favourite of Bristol's holy trinity Livity Sound, his early releases on the trio's label of the same name, as well as on Nantes-based Fragil Musique show a clear affiliation with the south west, whilst more recent output on Wisdom Teeth and Lyon's BFDM imprint highlight an innate ability to push audiences and flourish in the leftfield. We can't wait to have him down. You'd be hard pressed not to have heard Laksa's innovative brand of fuzzy, euphoric groovers on the dancefloor. With early EPs on Batu's Timedance and Beneath's Mistry labels, Laksa has garnered support from far outside of London or Bristol and this summer landed himself place on the Ilian Tape roster with his essential 12 - "Camo" - which since its june release continues to make huge impact. Re-defining and blurring the lines between breaks, techno and bass on his monthly NTS Radio show, we hope you enjoy him at the controls as much as we do.